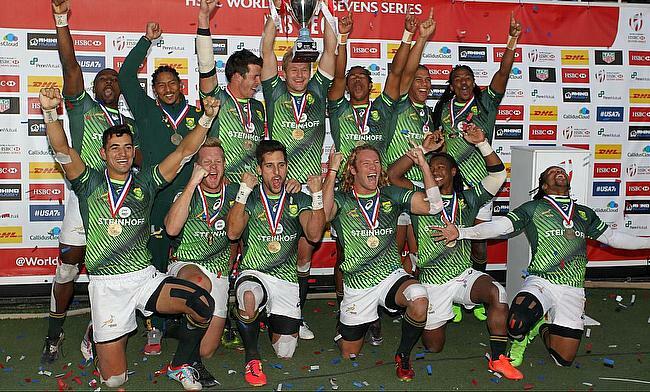 South Africa continued their terrific run in World Rugby Sevens series 2016-17 after they clinched the Las Vegas sevens by defeating Fiji 19-12 in the final. This is also South Africa's third title victory in the series having earlier won the Dubai, Wellington and Sydney sevens as well taking them to 107 points in the table - a lead of 24 points over Fiji. England, who won the Cape Town sevens are placed third, two points behind Fiji. South Africa topped Pool A winning all the three games against Canada, France and Wales and sealed a thrilling 17-14 win over Australia in the quarter-finals. In the semi-final, South Africa encountered a tight game against Mike Friday's USA sevens. Tries from Dylan Sage and Ruhan Nel helped South Africa stage a comeback to 10-12 at half time. In the second half Werner Kok provided Blitzboks early advantage and later on Sage scored the decisive try to make it 20-17. South Africa held their nerve in a tense final against the Rio Olympics gold medalists Fiji after Cecil Afrika, Chris Dry and Rosko Specman crossing over and was greatly aided by a red card to Sevuloni Mocenacagi to seal a 19-12 win. Blitzboks head coach Neil Powell was extremely satisfied with the performance of the team. "We're happy with how it's been going the last few tournaments and the guys are believing in a system and working for each other," he said. " "They are showing a lot of pride in the jersey and the fact that they can play for their country. They showed a lot of composure in the final and managed to take control back in the second half." USA occupied the third position in Las Vegas sevens after beating New Zealand 19-15 in the Bronze Final while Kenya won the Challenge Cup Final defeating Samoa 21-14.